Iguania is a suborder of Squamata (lizards and snakes) which includes iguanas, chameleons, agamids, and New World Lizards. However, most of these reptiles except agamids do not occur naturally in Malaysia. Iguanians generally live on trees and possess primitively fleshy, non-grasping tongues, and are believed to be closely related to snakes. 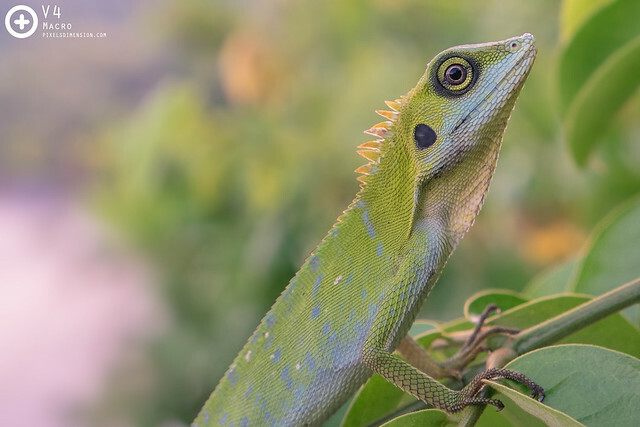 Iguanian lizards in Malaysia are generally small to medium-sized, and can often be found perching on trees during mornings, basking for sunlight. These lizards generally remain inactive unless disturbed, and are known to change the colour of their skins based on environmental conditions. #1. A pair of Great Angle Head Lizards (Gonocephalus grandis). Beautiful Great Angle Head Lizards perching on tree trunks to sun themselves for energy.The male (left) has cool-looking body crests and richer body colours as compared to the female (right). Both lizards display yellow ventral spots although the ones on the males are surrounded by bluish body tints. Like most lizards, these will change colour depending on behaviour and environment. Male may fight with one another, but usually the females will choose the males with the most brilliant display of colours- an indication of good genes and health essential for the survival of their next generation! #2. 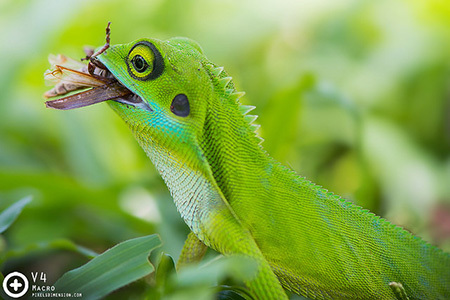 A Green Crested Lizard (Bronchocela cristatella). A beautiful lizard basking in the sun. 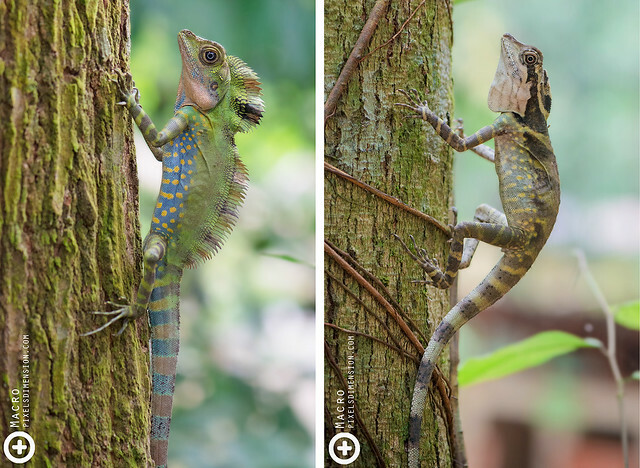 Theis particular species of lizards appear to be dwindling in numbers in many places due to competition with the more common Oriental Garden Lizard (Calotes versicolor in #3). #3. 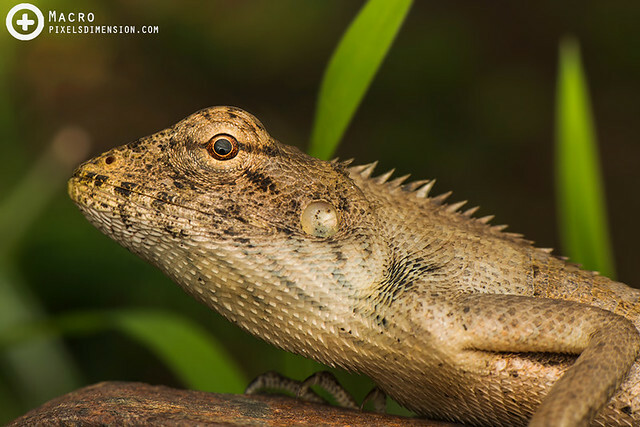 A female Oriental Garden Lizard (Calotes versicolor). 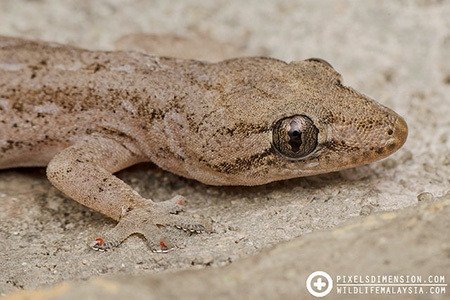 This particular species represent one of the most common lizards in Malaysia, and as the Latin name suggests, these lizards can occur in a wide range of colours. #4. A Mountain Horned Dragon (Acanthosaura armata). 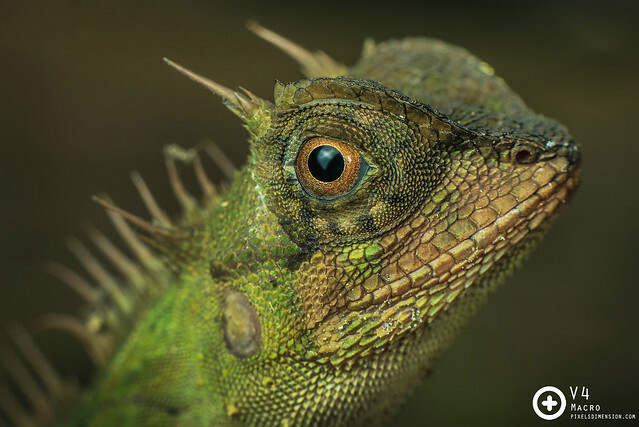 These lizards are known for the distinctive pair of horns on the top of their heads. Like many other lizards, Mountain Horned Dragons can be found basking under the sun, and often remain oblivious to humans.